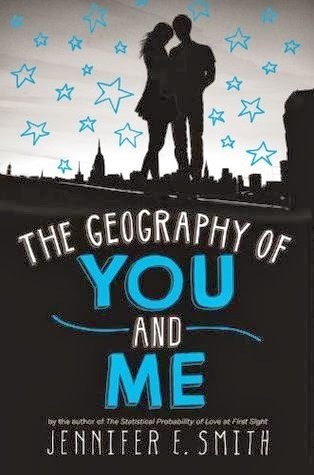 Jennifer E. Smith’s latest young adult novel The Geography of You and Me is like a caramel sundae – delightful to the taste, but perhaps a touch too sweet for those who aren’t overly fond of dessert or, in this case, fluffy romance. Many of the events would only happen in a film (which make them unbelievable in a ‘real life’ context), but I still couldn’t help but fall in love with The Geography of You and Me. The promise of an adorable romance is impossible for me to resist, and adorable is exactly what readers of The Geography of You and Me will get. Lucy and Owen have their meet-cute in an elevator during a city-wide blackout, an unusual situation that lends immediate gravity to their meeting. From there, the progression of their relationship follows the path set by many a chick flick – sweet moments, a disillusionment period, and an argument or two. What sets it apart is the fact that Lucy and Owen’s lives intersect for such a short period of time, days really, after their first meeting. They then end up heading in opposite directions, with Owen and his father going out to the Western US and Lucy joining her mother and father across the pond. Yes, you read that right – the relationship unintentionally becomes long-distance shortly after it begins. This is really the main reason I liked The Geography of You and Me so much. Their relationship invites the reader to ask, “Is it possible to form a connection with someone that you’ve only known for a few days?” followed by “Can that sort of connection withstand so much distance?” and even “How can you maintain that sort of relationship?” As someone in a long-distance relationship, these are questions that I’ve encountered many times before. It’s fascinating to see how Smith addresses the issue of time and distance and how it factors into a romantic relationship (or even a friendship), especially from the perspective of teens. Though technology makes it incredibly easy to stay in touch with people from all over the world, it doesn’t mean that it’s any easier being apart. It was both fun and heart-warming to see how Lucy and Owen kept in touch, in spite of the distance, especially through the post cards. But Smith also made it seem real by showing how simple it can be to misunderstand a message when you’re unable to pick up on the sender’s real tone or intent. The Geography of You and Me is primarily about Lucy and Owen’s relationship, but readers also get to see how each of their lives is faring separately. Sadly, I was unable to fully identify with either one, though there were parts of their personalities that I related to, like Lucy’s passion for reading and Owen’s devotion to his father. The benefit of being able to read about their separate experiences, really, is that readers will be able to “visit” many places. New York and Scotland are the two specifically mentioned in the summary, but there are more – and it’s a lot of fun! I really liked getting a chance to “travel” with these two, and I was constantly fighting off wanderlust as I read about each place. Jennifer E. Smith has once again written a cute contemporary YA, with a romance that reminds readers that anything at all is possible (in the way a chick flick would). The Geography of You and Me is just a wonderful, easy read that will make readers smile and believe in romances like Lucy and Owen’s. It’s definitely a perfect read for dreamers and romantics, like me! I love cheesy, too sweet romances! This is one book, sadly, still on my TBR list. It's not often that I'm in the mood for an overly cutesy romance, but I love that they sent each other postcards - that's just too adorable! A food analogy! I love those. And now I want ice cream. As for the book, I keep seeing a lot of people say the same thing about how it was hard to really connect with the characters, which obviously lessens the enjoyment. Travel is a big yes for me though because I always like to "see" these places more in books. I was undecided on if I should read it because I hated the thought of it going into insta-love, but love the questions surrounding the plot...and now you sold me ;) I'll beware of the fluffiness! This is why I love reading other people's opinions, I would never say this was a sweet, romantic book. After reading it I actually don't think it was a romance at all. Maybe that means the book failed me in some way, but I thought it was a book about Lucy and Owen separately and then their friendship, which always seemed very real to me. I really liked how they each lived their own lives and weren't pining after each other or obsessed after such a short period of time, you know? Thank you for review! I'm not sure yet whether I'll pick this one up - it's not the type of romantic story I usually enjoy. I think the first book of Jennifer Smith's I'll try will be The Statistical Probability of Love at First Sight. I'm glad you enjoyed this overall though, Alexa! I loved Statistical but was only so-so on Happy, so I've been hesitant to pick this one up. I'm glad I read your review! I think I've decided that I definitely need to read it - I just might grab it from the library instead of purchasing and THEN buy it if I end up falling in love.